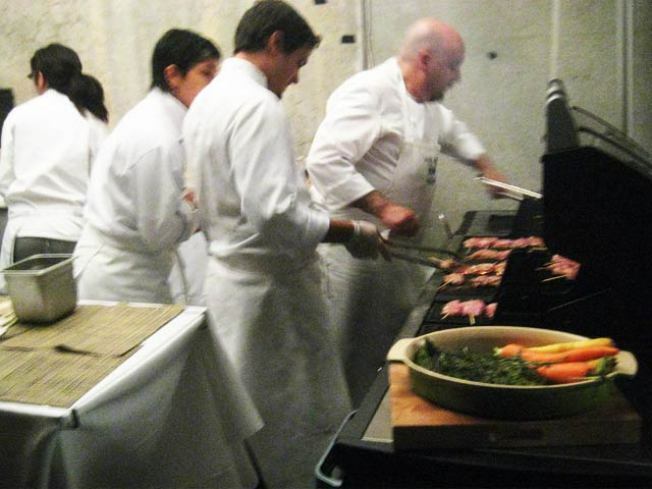 A scene from the last Le Fooding at MoMA PS1, which reprises this weekend. LE SHOWDOWN: By now you’ve no doubt heard the David Chang quote that launched a thousand pinched/irate blog posts: “F@#%*n’ every restaurant in San Francisco is just serving figs on a plate with nothing on it.” This spirit of gastro-one-upmanship fuels this weekend’s Le Grand Fooding: It’s NYC vs. SF at what’s arguably the biggest, baddest food face-off of 2010, with Chang (Momofuku) and Daniel Patterson (SF’s Coi) heading up the east Coast vs. West Coast roster. Two nights of tastings kick off at MoMA PS1 ce soir; proceeds benefit Action Against Hunger. 7PM. ULTRA ‘VIOLET’: You’ll have to hike it to the Wellmont Theatre in Montclair, but fans of Brooklyn-based band The National (with a recording studio in Ditmas Park, even) know the boys’ moody, layered melodies are more than worth traveling to Jersey for. So get a Zipcar and crank High Violet (their 2010 release, to the uninitiated) on the way. Doors 7, show 8PM. SUDS UP: Hello, NY Craft Beer Week. We’ve missed you—and we’re thirsty. The week (which is actually 10 days long, lucky us) includes formal events and glorified happy hours, shining a light on suds professionals from homebrew experts to brewery bigwigs. Tonight’s Freaktoberfest is the official fest kickoff: 35+ brewers will pour as the Coney Island Sideshow does its thing (swallowing of swords, etc.) at Park Slope’s Rock Shop. 7PM. For this and more fest events, head to nycbeerweek.com.